For the surfing adventurer, Outer Atolls Surfaris explore the truly isolated southern atolls on Horizon 2. a fully equipped, live-aboard motor cruiser featuring comfort and reliability without the luxury price tag. In 2019 Horizon-2 will again operate 10 night scheduled charters from February through to November for exclusive group or individual bookings. While March/April & September/October are regarded as the premium months, May to August is the peak of the Indian Ocean swell season and whatever the conditions there is virtually always a break that will be on. Horizon-2 is a modern cruising vessel built in 2002, refurbished and very well maintained. For over 14 years the Horizon-2 charters of the Outer Atolls have been the reliable and most affordable option for this region. 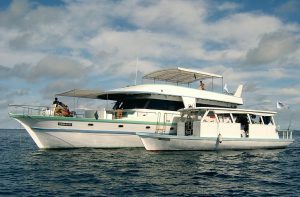 A comfortable mid-range boat with 6 x Twin a/c cabins each with bathroom; there’s has a support dhoni; experienced surf guide and the awesome cook Chaminda serving fantastic meals. The breaks in the southern atolls work on a wider range of swell and wind conditions than those of the Inner Atolls so an experienced Outer Atoll captain and surf guide are essential. We were the first company in the 1990s to operate Outer Atoll surf tours in the region and know that the Horizon-2 captain and crew are as reliable as you’ll get. This is a remote region, and our well established emergency procedures have proved to be of vital importance on a few occasions when serious medical problems have occurred. Horizon-2 has all the necessary safety and communications equipment including Marine Radar, VHF, Radio Telephone, mobile phone (most areas), GPS, desalination plant, generators, and a trained and experienced crew. In the Outer Atolls you can snorkel on unspoilt reefs, catch a fish for dinner and see parts of the country that most tourists never experience. And you can surf some of the best waves of your life!